You have a webinar coming up in five minutes. You check the attendance list: 500 RSVPs – a new record for you. You are pumped! You hop onto the call and only 10 people are there. You make small talk with the audience as more people trickle in. 20 people. 30 people. 37 people. It’s 2 PM and you have to start the webinar. By the end of it, only 42 attendees actually attended the call. That is less than 10% of all the people who signed up. You get disappointed. What didn’t more people show up? It’s probably not because they didn’t like you. They were probably busy. They prioritized other things. Or they most likely forgot. I admit that I’ve signed up for countless webinars and never actually showed up. Most of the time, I genuinely forgot. But what if at the right time and right place… I was reminded of the webinar and gave me an easy link to join. 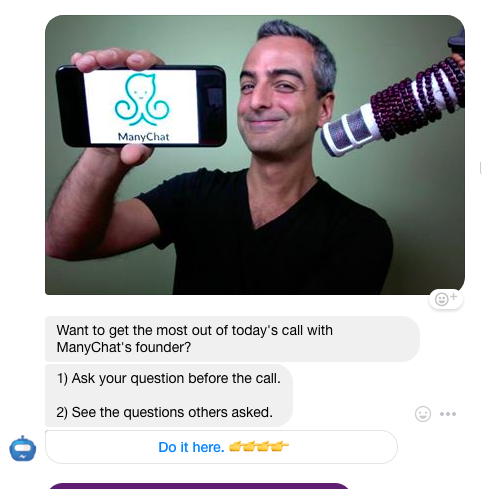 Well now you can do this automatically through Facebook Messenger, the platform where everyone is already on! This is the technique that we use (and help clients) to increase their webinar attendance rates. You can send automated reminders for many use cases: cart closing, Facebook LIVE, product launches and more. 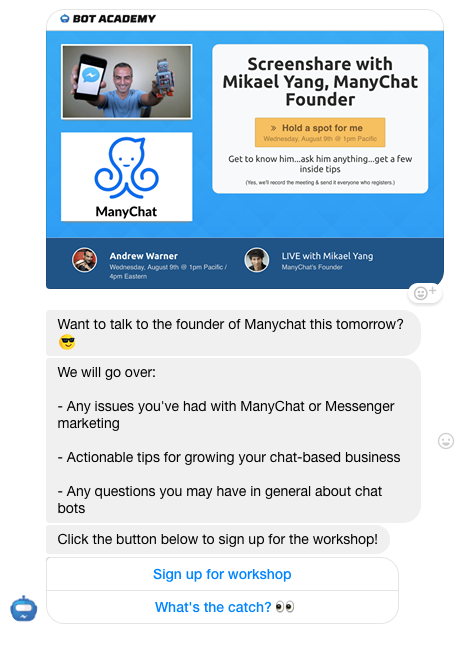 Example 1: Getting people to come to our Workshop with Mikael Yang, the founder of Manychat. We sent our audience a broadcast message if they wanted to sign up. On the day of the call, we sent our audience a message asking if they want to ask any questions to Mikael. One minute before the call, we sent them another message asking them to join now. 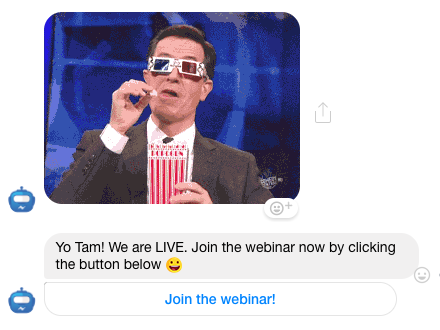 We sent our audience a reminder one hour before the webinar started. Two minutes before the webinar, we sent another reminder to invite them to join the call. The more touch points you have with your audience, the better results you’ll get in every area of business. We did all of this ON TOP OF sending email reminders at different times so there are MULTIPLE touch points between the workshop hosts (us) and our audience. These messages are short, funny, and straight forward. Join the freaking webinar… and they did! 95% open rates, 42% click rates when we went live. Wow! We ran multiple webinars and messenger reminders helped our attendance rate so much more. 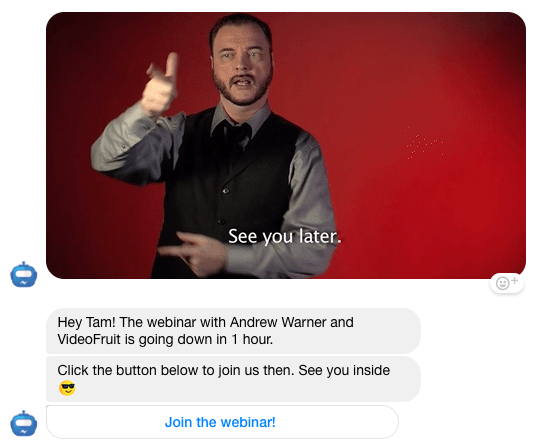 Let’s send 2 messages: the 1st message reminds your audience about the webinar (or whatever you are trying to get them to click) 1 hour before, and the 2nd message reminds your audience about the webinar when you are live. 3. Under “Targeting”, choose what part of your audience you want to target. 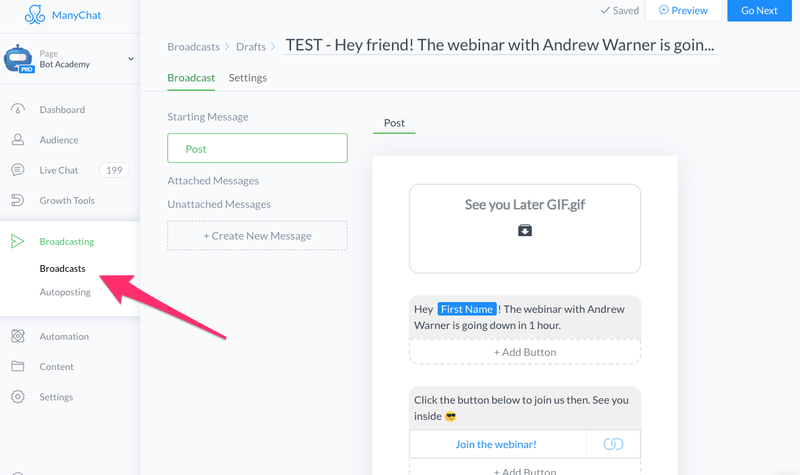 It’s really easy when you have people opt into your webinar through a specific growth tool. So you can send this message to the people who opted in EXCLUSIVELY through that growth tool. 4. Under “Schedule Broadcast”, choose the time you want to send it. 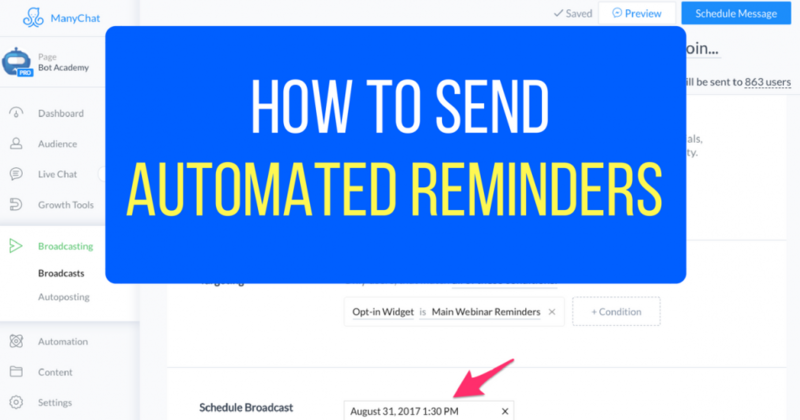 If your webinar is on August 31, 2017 at 2:30pm, and you want to send it before, then choose August 31, 2017 at 1:30PM for the time to send the message. 5. 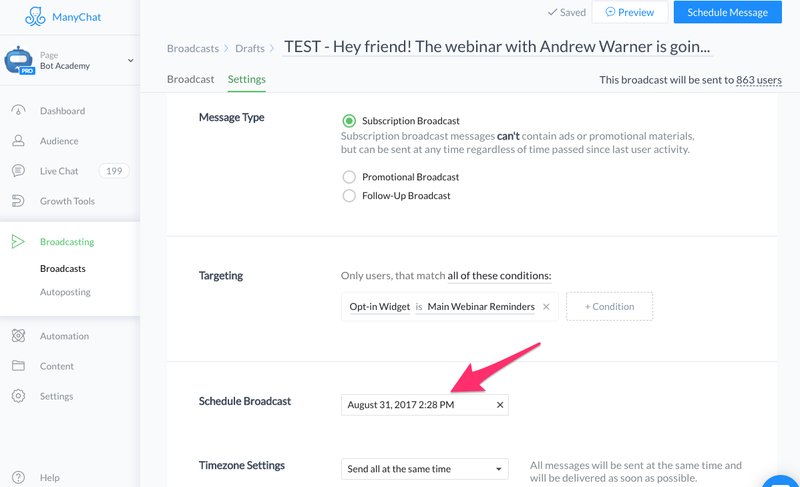 For the 2nd message that you want to send to those same users 2 minutes before the webinar starts, repeat the same steps except now change the timing to 2:28PM if your webinar is at 2:30PM. 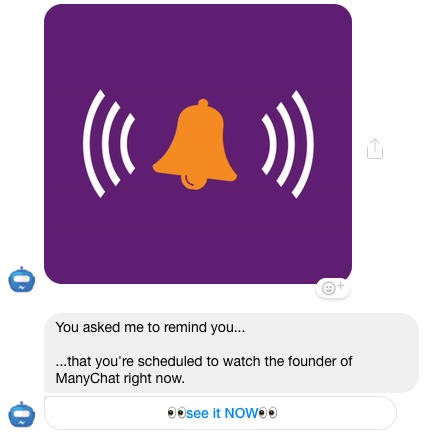 Once you do these steps, everyone targeted will get an alert via Messenger when you are live. 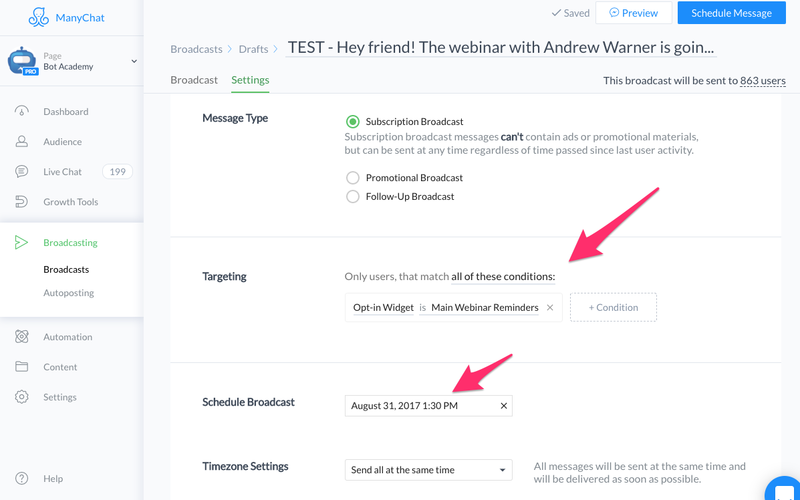 You can do this weeks in advance and users who subscribe after you schedule the broadcast will still get the message (if they opted in to the group that you are targeting) so you don’t even have to worry about sending it – or doing things last minute! Good luck to your chatbot journey and give amazing reminders to your users!